First pictures from our road trip are now up... Pictures from Great Sand Dunes National Park (tallest sand dunes in North America, at 800+ feet tall) and a bonus Monarch Pass picture. It's ok to be annoyed or worse about a bunch of other people coming to one of your spots and mucking it up by doing what they think is fun. Tobaganning is pretty much like ATVing through a public forest so I understand the point- if the dunes don't cover the tracks quickly by moving. They grow fast, or at least, they regrow every season. 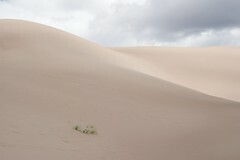 And while it's fairly windy, it's intermittent -- I don't know how fast the dunes move, but they do. It's not like they'll damage the dunes. In a year or so, all traces would be gone, I think (or at least, they will be eventually). I just don't like the crowds -- it's not nearly as bad as the dirt bikes or snowmobiles in other places.